Duke Pearson occupied an unusual position within Blue Note Record's roster of artists. In addition to recording as both leader and sideman he also served as the label's A&R man, following in the footsteps of Ike Quebec. 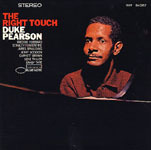 Pearson also served as the arranger on many albums, including sessionsStanley Turrentine's Rough 'n' Tumble, comes to mindwhere other pianists took over the keys. 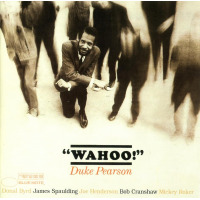 Pearson's own WAHOO! carries an exuberant title for what turns out to be a pretty laid back record featuring 1960s Blue Note stalwarts Donald Byrd and Joe Henderson, as well as the flute and alto of James Spaulding. Conceding that an album evokes only what's in the reviewer's head, the date has a transitional feel between the hard bop, already in vogue for half a decade and, in places, some of the more stylized arrangements that would come from the CTI label a few years on. Regardless of what it echoes or predicts, WAHOO! holds up really well. The title track, a very stately mid-tempo blues, starts with a melody and three-horn harmonization that might have done duty as the Indian's theme on the sound track for a western. But that feel quickly gives way to Pearson's chord-heavy extemporization, pulling it all firmly back to New York in the mid-sixties. It's a great example of Pearson's triple threat as composer and arranger, where he could invoke atmospheres and images, and his first rate skills as an improviser. On "ESP," Henderson reminds us why he was one of the era's tenor greats with a long improvisation that, at it's opening, finds him adding melodic layers over the theme before branching out into an imaginative, well structured solo. Byrd follows with brassy, harmonic scales dropped over Pearson's comping, highlighting the contrast between the stylistic interpretations of the two horns. WAHOO! is a bit of rarity within the Blue Note catalog, possibly due to nothing more than a filing error. According to Ron Rambach at Music Matters, who is releasing this title as part of his Blue Note reissue series, someone had stored the tape in the wrong box making it difficult to track down. Whether or not that's the reason it's been infrequently re-released since it first hit the street in 1965, it's fortunate that it was uncovered in time to be included in final few Music Matters titles. WAHOO! exemplifies the way jazz was evolving during the mid-sixties while also turning in first-rate performances from some of the label's most reliable performers. It's a record with compositional continuity, distinct arrangements and strong improvisations from everyone involved: a terrific jazz performance. Track Listing: Amanda; Bedouin; Farewell Machelle; Wahoo; ESP (Extrasensory Perception); Fly Little Bird Fly. Personnel: Donald Byrd: trumpet; James Spaulding: flute & alto saxophone; Joe Henderson: tenor saxophone; Duke Pearson; piano; Bob Cranshaw: bass; Mikey Roker: drums. Duke Pearson CD/LP/Track Review Greg Simmons Music Matters Ike Quebec Stanley Turrentine Donald Byrd Joe Henderson James Spaulding Wahoo!